Today I had to get up extra-early to go to the gym. I won't be able to make my normal Thursday timeslot because I have class then, so I had moved it to this morning. Which made for a tired, but quite vigorous, workout. I think the pharmacist's advice helped, too. I slept well last night, and was doing much better today. After my workout, though, I did have to shake a leg to make sure I could get to class on time, with a banana as a quick snack. I did actually end up getting there early, though, and sat in The Hub until it was time to go to class. The instructor was an engineer whom I'd briefly spoken with before; I needed to talk to her about data I'll be needing for my starter project. More about this class another time; for now, I'm hoping to get done writing this by midnight. Okay, that was one sign. I read another today. I'll preface this by saying that we normally use ceramic plates and metal flatware, which can be taken elsewhere and left in a microkitchen to be bussed if so desired. There are also disposable "to-go" boxes and flatware. The other sign was about that. We are now using non-oil based disposable "take-out" packaging made from renewable, tree-free, resources that are sustainable, compostable and biodegradable. Our paper plates, take out boxes and soup cups are made from "sugar cane bagasse," the fibrous residue remaining after juice is extracted from the crushed stalks of sugar cane. The use of this agricultural waste product to make food containers prevents it form being burned in the sugar cane fields, reducing air pollution and the production of greenhouse gasses. Our new 100% corn-plastic cutlery, clear take-out and deli containers are made from NatureWorks(TM) PLA, a corn based plastic. Naturally derived from corn, the basic raw materials for PLA are carbon dioxide and water. Growing plants, like corn, take these building blocks from the atmosphere and soil. They are combined in the plant to make carbohydrates (sucrose and starch) through photosynthesis. Dextrose, a natural sugar derived from the starch in kernels of corn (or maize) is used as the primary raw material for PLA. NatureWorks(TM) PLA uses up to 50% fewer fossil resources than conventional plastics in its manufacture. It can compost completely back to carbon, water, and organic matter, keeping a balance in nature. Now, lunch is done, and back to classes. They were over interested topics, but by the end of the day I was still a bit glazed over. The classes took up most of my day, and as I write this, it's now just a bit past midnight. (Part of this is because I got distracted watching "House".) I guess that means it's time for me to send this off. 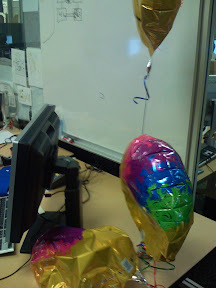 I remembered to take a picture of my balloons today. It looks like they're almost done with their job. I suppose the MTBF for mylar balloons is about 2 weeks; I've only got a short time left of being a Noogler.